Scheduling time to get together with another blogger! Is the other blogger in top photo a bit of a mystery? Now you see her, now you don't? If you guessed it's Chrissy from Granola & Grace, you're right! Chrissy and I met at the #sipandmingle blogger workshop in Orlando a few weeks ago and hit it off right away. At that time we talked about meeting up again for a shopping trip. Being in Tampa Bay, I'm roughly an hour from Sarasota where Chrissy lives. 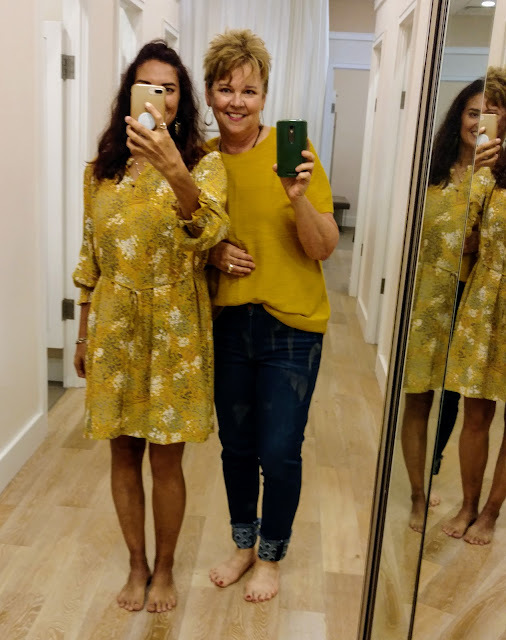 Our initial plan was to go thrifting in Sarasota, but she was committed to a LOFT try on when our anticipated date rolled around. I knew we'd have fun whatever we did, so we decided to go for it at LOFT. After a quick stop at Kahwa coffee shop for matcha tea and a (gluten free) muffin, we made our way to LOFT. 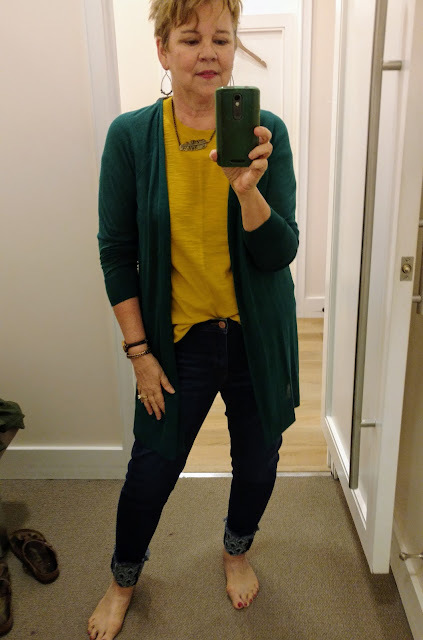 To see Chrissy's try on check out The LOFT Try On Adventure Sunday Showcase post. After all of our trying on, we left the mall and went to Sweet Tomatoes, which was close by, to use a free coupon from the conference for lunch. (You may have seen the Insta story Friday.) The food was fresh and there was plenty of it. In addition to an extensive salad bar, there were also soup, bread, and dessert stations. Chrissy is such a joy to spend time with. She's thoughtful and gracious. She has a lot of outward flowing energy, which is one of the reasons I think we hit it off. Chrissy is also a patient listener as she's heard me talk about some (too much, maybe) personal frustrations and heartaches. We're fond of similar styles, too. Being more Insta savvy than I am, she helped me muddle along with my Insta story. I'm hoping we get to plan another meet up, fingers crossed, for when she's done homeschooling her boys for the year. We had so much fun ambushing LOFT at University Town Center (UTC). I think we only scared one, maybe two, women out of the dressing room! Let's go over the try on pieces, shall we? 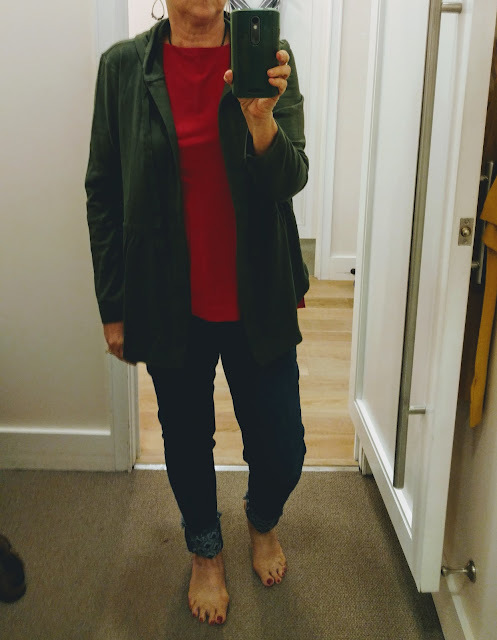 A run down of the three pieces in this photo: 1) Knit olive utility jacket with drawstring waist, shirttail hem and a hood. Cute enough. I didn't love the shirttail hem on this style of jacket. (I can't find it on the website.) 2) Vintage Soft Swing Tank red/coral sleeveless top with high neck. This is cotton and has a slightly curved hem. Nice as a basic if you need one. I wasn't fond of the higher cut neckline. 3) Embroidered Roll Cuff Slim Pocket Skinny Jeans. High waisted, dark wash, turned up subtle embroidered detail on hem. 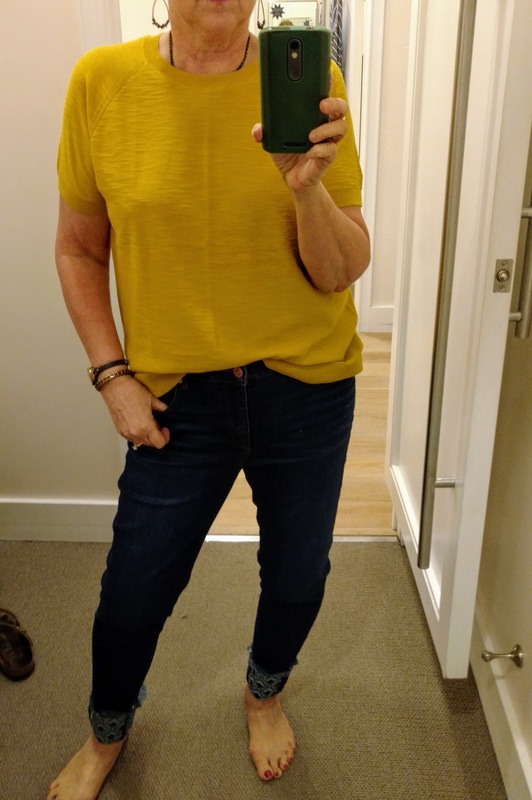 I loved these jeans, but they didn't have my size in the store. The one's I'm wearing are a size too big (Size 32/14). The "I don't need these" rational: The wash is darker than I'd like and we are heading into summer. Here we have the same jeans with a Sheer Open (teal) Cardigan and mustard gold fine-knit sweater. This was a very nice combo. The cardigan is light weight and would be good for summer weather. These are the same Modern Soft Slim Pocket Skinny Crop jeans Chrissy tried on. I loved them on her, me, not as much. A little repetition here. Same jeans and top as above. The Sweater Tee top gets a spotlight all it's own. It's a fine knit 100% cotton with ribbed banding at the neck, sleeves and waist. I tried it on in XL and Large. I bought the XL (shown above-$25), because I liked it better over-sized. The knit makes it feels like a luxurious t-shirt. Now onto the two of us! Here we are at Lucky Brand store. Have you seen the same style of jeans I'm wearing on Chrissy on her blog??? Yep, same ones. (Sorry, not on website.) 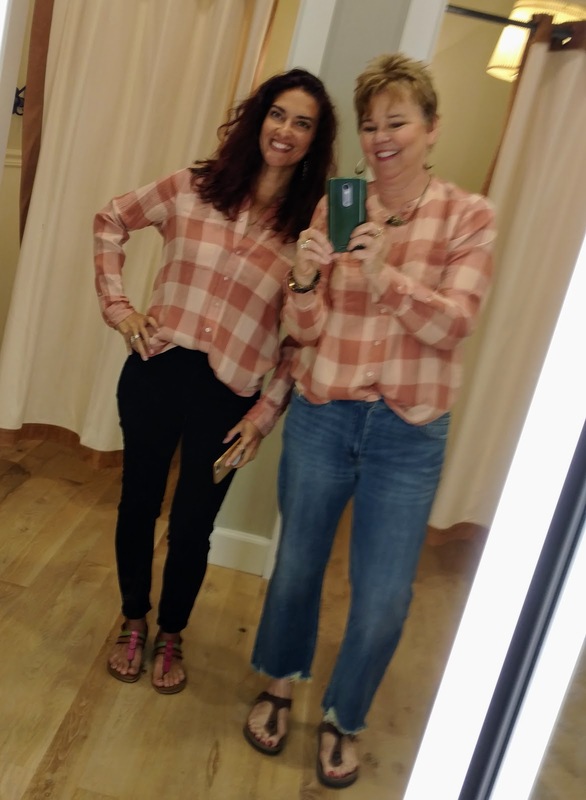 We both liked this Classic Shirt top, so decided to twin. It looks so much better on her coloring. 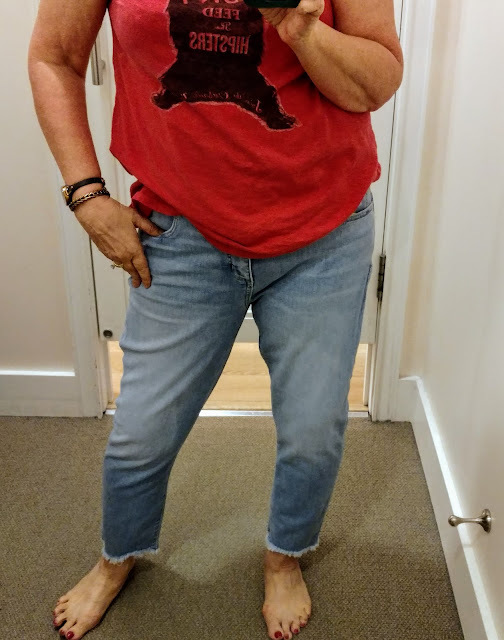 The jeans ($29) came home with me! It is so worth it to make time to meet up with other bloggers if you get the chance. I know I can't wait to "ambush" another shopping destination with Chrissy! Don't forget to visit Salazar at 14 Shades of Grey to see the Style Imitating Art Round Up today!